Having taken Italy by storm, and threatening to prematurely terminate the career of German Chancellor Angela Merkel with his staunch opposition to further European migration, Matteo Salvini – leader of Italy’s populist League – said on Sunday he wanted to expand its success to create a pan-European association of like-minded, nationalist parties. 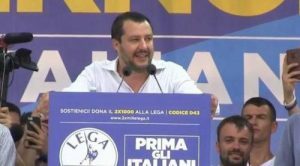 During a keynote speech at the League’s annual gathering in countryside north of Milan, Salvini said the League would govern Italy for the next 30 years, receiving rapturous applause from thousands of flag-waving supporters, according to Reuters. “What we have managed to do this year, next year we will do at the continental level,” Salvini said, eyeing the elections for the European Parliament in May 2019. In his appeal to build a network of right-wing, nationalist parties around Europe, Salvini cited France’s National Front leader Marine Le Pen, Hungarian Prime Minister Viktor Orban and Austrian Chancellor Sebastian Kurz, among others. The 45-year-old Salvini is enjoying a surge in popularity, with the League now commanding about 30% of support in opinion polls and recently surpassing its coalition partner, the anti-establishment 5-Star Movement, as Italy’s largest party. Since an inconclusive March 4 election when 5-Star took 32 percent and the League 17 percent, Salvini has dominated the political agenda with an aggressive and popular campaign against immigration. To be sure, Salvini’s political achievements are nothing short of amazing: when he became leader in 2013 of the movement then known as the “Northern” League, it was reeling from a corruption scandal and had only about 5% of voter support. It is now Italy’s largest political party. Salvini, capitalizing on brutal disenchantment with establishment politics in Italy, is now deputy prime minister and interior minister in the coalition that took office on June 1; he said with its tough line on migrants and in negotiations with the EU, the government had done more in a month than its predecessors had done in 6 years. “Will you swear not to give up until we have liberated the peoples of Europe?” he asked, receiving a unanimous “yes” in response. It is unclear how Europe’s enlightened, progressive leaders in Germany and France will respond to this unexpected challenge for continental dominance from a person nobody had heard of until several years ago.